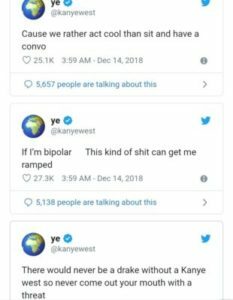 Kanye West is using his favorite platform to drag out his feud with Drake. 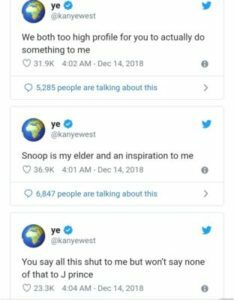 On December 13, Kanye took to Twitter to call Drizzy out for ducking him and playing industry games. The G.O.O.D. Music creator continued to rant until it abruptly ended with him suggesting that Drake had finally called him. He threw in a spiteful tweet about not clearing a sample that Drake had requested as well. 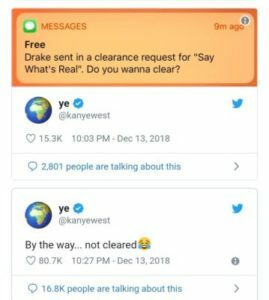 All was quiet for just a few hours until Kanye returned to Twitter to claim Drake threatened him. He also suggests that if anything happens to his family that Drizzy should be the number one suspect. While Drizzy may be flexing his muscles on the ‘Gram these days, it’s highly unlikely that the “Finesse” singer will be coming after anyone’s family. 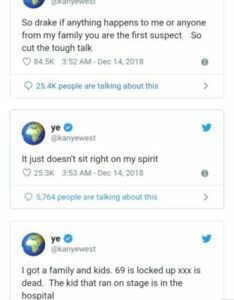 Kanye also claims that Drake paid people to disrupt Pusha T’s show in Toronto, and says that one of the stage rushers is currently in critical condition. 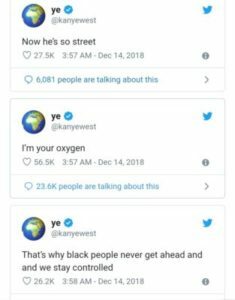 Somehow, Drake’s line about having a bigger pool than Kanye got dragged into the conversation too. Kid Cudi’s mental health, Drake’s Kanye influence, Tekashi6ix9ine, religion, and Travis Scott are all brought up by Mr. West during the rant as well. We will keep you posted as more events unfold.